Epigenetic antibodies you can trust! Antibody quality is essential for assay success. Diagenode offers antibodies that are actually validated and have been widely used and published by the scientific community. Now we are adding a new level of siRNA knockdown validation to assure the specificity of our non-histone antibodies. Short interfering RNA (siRNA) degrades target mRNA, followed by the knock-down of protein production. If the antibody that recognizes the protein of interest is specific, the Western blot of siRNA-treated cells will show a significant reduction of signal vs. untreated cells. on siRNA transfected cells (lane 2) and on untransfected control cells (lane 1). The below list shows our first siRNA validated antibodies. More results - coming soon. Add CTCF polyclonal antibody - Classic to my shopping cart. Add EZH2 polyclonal antibody - Classic to my shopping cart. Add HDAC1 monoclonal antibody - Classic to my shopping cart. 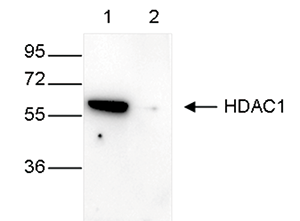 Add HDAC1 polyclonal antibody - Premium to my shopping cart. Add HDAC2 monoclonal antibody - Classic to my shopping cart. Add LSD1 polyclonal antibody - Pioneer to my shopping cart. Add Pol II S2p monoclonal antibody - Classic to my shopping cart. Add Pol II S5p monoclonal antibody - Classic to my shopping cart. Add TBP monoclonal antibody - Classic to my shopping cart.